1. In a large bowl or shallow plate, season and combine chicken strips with salt, and pepper. Set aside. 2. Wash and trim the ends of the zucchini. Make the zucchini noodles using a spiralizer or a julienne peeler. Set aside in a salad bowl. 3. Heat 1 tablespoon butter in a large skillet over medium-high heat. Once melted, add the chicken strips in one layer and cook for one minute without stirring. 4. Add minced garlic, and red chili pepper flakes then stir up the chicken strips to cook on the other side for a couple of minutes, until almost cooked through. Remove from the skillet and set aside to a plate. Make sure not to overcook chicken at this time – otherwise, it could dry up. 5. In the same skillet, melt 3 remaining tablespoons butter, then stir in lemon juice and zest, Dijon mustard, hot sauce, cayenne, paprika, and chicken broth. Bring to a simmer and allow to reduce for 2-3 minutes, stirring regularly. 6. Stir in the fresh parsley, chopped chives, and minced thyme, then add the zucchini noodles and toss for 2 or 3 minutes, until zucchini are cooked through and the sauce has reduced a bit (zucchini will render some water). Return the cooked chicken strips back to the pan and cook for another minute. 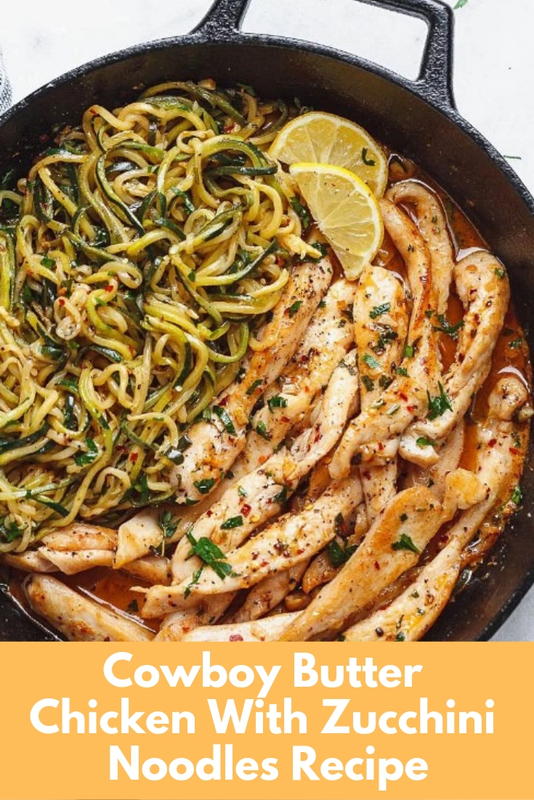 Serve your cowboy butter chicken with zucchini noodles immediately, garnished with more herbs, red chili pepper flakes, and lemon slices. Enjoy! You can buy pre-spiralized zucchini and sliced chicken breast in your grocery store, prepping will be even faster!